RenuWall® Weatherproofing System is custom-installed, providing outstanding resistance to weathering, temperature changes, ultraviolet radiation and mildew. It retains its bright color, long- term flexibility, and breathability for many years, resulting in excellent adhesion, elongation and toughness. This watertight weatherproofing system can be installed right over your existing walls. The RenuWall Weatherproofing System requires minimal maintenance and offers worry-free weatherproofing. RenuWall® provides a tough film that moves with the expansion and contraction cycles of a building to keep hairline cracks well sealed. As shrinkage cracks occur in new stucco, RenuWall bridges these openings to maintain a water tight and attractive surface. 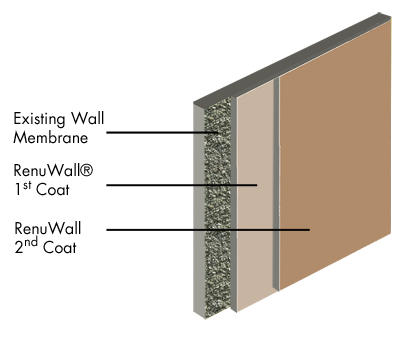 The RenuWall weatherproofing system prevents water from entering the building through cracks as small as one-sixteenth of an inch, keeping the interior of the building dry and waterproof. RenuWall coatings have high vapor permeability allowing moisture vapor to flow out of the wall and prevents liquid rainwater from infiltrating into the wall assembly. Superior dirt pickup resistance allows RenuWall to continually look fresh and new throughout its lifespan. RenuWall is environmentally safe and easy to use. RenuWall exceeds stringent ASTM D6083 and AIA 9830 performance requirements for elastomeric waterproofing coatings.